Indeed, emotions run deep. It does not matter what gender brings a child to life, what matters most is the love the child is shown. After reading this piece, you will agree that a father’s love knows no bounds. Fathers are important figures in the lives of their children. The emotionally balanced and financially stable ones know what it means to have a family. People are quick to assume that women bear the burden of nurturing children till they grow. They associate a child’s growth and development with the consistent sacrifices and love of a mother. The point is, there are still some fathers who are ten times better than some mothers. These fathers will do anything to ensure the safety and well-being of their children. Of course, men like these are rare, but they exist. The man which this post is about is a father indeed and a father in need. 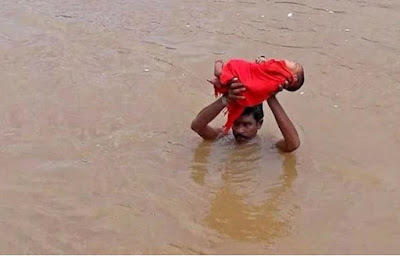 Pangi Satibabu had to walk through the flood in order to take his sick child to the hospital. His picture will remind you of the sufferings of people in other nations. Men are sensitive to the needs of their children just like the women. No father ever wants to lose his child; fatherhood bears different weight to men all over the world. Satibabu is a 30-year-old farmer who hails from Kudumusare village in Andhra Pradesh. He walked for two hours through some deep floodwaters in order to take his 6-month-old daughter to the nearest hospital in India. The floodwater was as a result of some heavy rainfall. The caring father knew what risk he was taking when he decided to walk through the deep floodwaters.